Our qualified technician will come to you with no call out fee! Fridge0 Refrigeration offers same day service throughout Melbourne's Eastern and South Eastern suburbs. 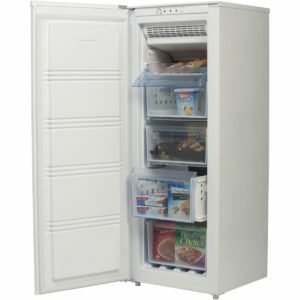 We service and repairs all makes of domestic upright freezers and chest freezers. All frost free upright freezers have a heating element integrated into the design. This part, due to the temperatures that it functions in, is the most common to fail. The purpose of the heating element is to melt any ice accumulated during the cooling cycle which usually lasts for 4-6 hours. Every 4-6 hrs the cooling cycle switches off and the heating cycle turns on engaging the heating element for a maximum of 20-30 minutes. During this time all the ice is melted of the coil and drained out the back of the freezer into a drip tray which then evaporates the water over time. The most common failure of the heating element is a gradual climb in temperature. Usually noticed when the top shelves start thawing the product out but the bottom shelves seem to be ok. Also a noticeable ice build up on the back wall of the freezer inside from the bottom up. Due to the heating element not functioning defrost cycle is not performed and over a space of 2 weeks the evaporator coil completely ices over causing irregular temperature distribution of air flow. Another most common failure of the heating element is that the unit starts tripping your safety switch. Usually when this occurs and you have isolated it to the freezer unit, it will be the heating element that’s causing the issue. The heating element needs to be replace for normal operation to resume. The most common symptom when a mainboard on a freezer unit fails is ice build up inside on the back wall at the bottom and product on the top shelves starting to thaw out. This usually means that the components on the mainboard have failed to time a defrost cycle and have caused the evaporator coil to ice over blocking air circulation. Another common symptom is that the freezer is dead silent no fan no compressor noise but the lights if any are still on and operational and freezer is warm with no cooling what so ever. This is usually a mainboard failure, The mainboard needs to be either repaired or replaced to resume normal operation. The most common symptom of a faulty fan is when the first few shelves are not cold enough and the products are starting to thaw out but the bottom half of the freezer seems to be OK. First thing to check is that the fan is working correctly. To do this without a multimeter, one can follow this procedure. First make sure that the compressor/motor is running. Once this is confirmed then either you can open the freezer door quickly and looking at the fan blades seeing if they are rotating. Some designs work only when the door is closed so if you open the freezer door and see the fan blade rotating to a stop then that is perfectly normal and your fan is OK. If the view to the fan is obstructed by panels which it is in some models then another way is to have your ear pressed up against the side of the freezer while the door is closed. If you can hear a humming or a buzzing which stops while you open the freezer door then your freezer fan is OK.